This Nintendo cartridge was used in Nintendo Powerfest '90. This game consists of three games. The first game is Super Mario Brothers. In that game you must collect 50 coins to move on. The next game is Rad Racer. In that game you must complete the first track to move on. The third and final game is Tetris. You spend the rest of your time racking up points in Tetris. When the time is up the game takes the score from Super Mario Brothers and multiplies it by one. The score from Rad Racer gets multiplied by ten and the score from Tetris gets multiplied by 25. I obtained this game from Mike on e-bay. 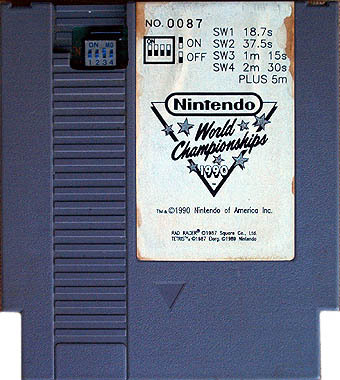 He got this cartridge when he competed in the competition it was used in. He is also the person that got first place in the Nintendo Powerfest '94. I met him in person when I was at the World Championships in San Diego, California in November 1994.